I just finished The Library Book , a nonfiction book about the worst library fire in the history of the United States-and no one knows about it. 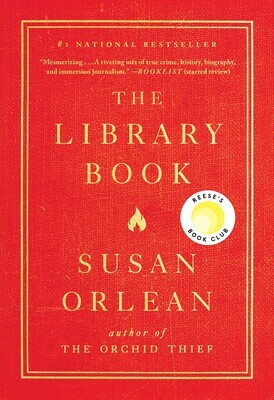 Although it’s ostensibly about the fire and the possibility of arson, it’s really a love letter to books and libraries. The Los Angeles Library caught fire in April of 1986, destroying hundreds of thousands of books. I’m not going to lie, that was hard to read. A lot of these books were irreplaceable, like an 1860 illustrated copy of Don Quixote. Hundreds of thousands more were badly damaged. Despite sounding like this wouldn’t be interesting for longer than the length of an article, this book is fascinating. I was invested in it from beginning to end, thanks in large part to the author’s attention to detail. I do sometimes wonder, with nonfiction: is everyone interviewed actually remembering things that clearly, or do authors add their own flavor to the book? Thoughts on that? I wonder simply because my own memory is so flawed that reading the incredibly descriptive writing was very impressive. Either way, this is a book worth reading. I really enjoyed it and, as someone who doesn’t read a ton of nonfiction, it’s encouraged me to to look for more nonfiction gems. I read an article once about writing nonfiction that encouraged nonfiction writers to write how they remember, putting that into the details. Its deceptive in that, as humans, our minds like to pick and choose what to focus on and expand on those details, often leading to exaggeration, but also a totally valid memory. So, I think that when interviewing people, the author probably srayed as close to the interviewees as possible, but you have to take into account the psychology behind their memory. I haven’t read this book, but reading your review, I going to. Adding to my TBR list. It sure sounds interesting, so sad🙁 about all those books burning. Yes, it was hard to read. All lost!